Students were asked, “How difficult or easy do you think it would be for you to get each of the following types of substances, if you wanted some?” For e-cigarettes, 31.9%a of students in grades 6-9 thought that it would be “fairly easy” or “very easy”, while 43.2%b thought it would be “fairly” or “very difficult”, and 24.9%c did not know. However, perceived access varied significantly by e-cigarette use status:175 79.8%d of users thought it would be “fairly easy” or “very easy,” compared to 26.5%e of never-users of e-cigarettes. Perceived risk was assessed by asking “How much do you think people risk harming themselves when they do each of the following activities?” for “Use an e-cigarette once in a while” and “Use an e-cigarette on a regular basis” (Figure 13.4). 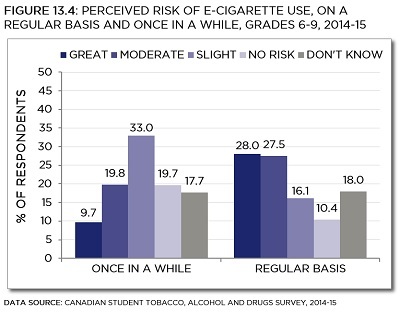 Overall, the majority of students in grades 6-9 perceived “no risk” or “slight” risk of using e-cigarettes “once in a while”, but “moderate” or “great” risk of regular use.